Whey Protein 80 is our award-winning premium grade whey protein concentrate. 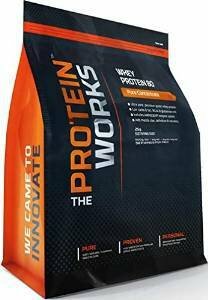 Winner of the highly coveted, "Best Protein Award" in the industry-leading FSN Product Awards, TPW, whey protein is known for its exceptional purity. It contains no thickeners or fillers and is available in a wide range of exclusive natural flavours. Whey Protein 80 is undenatured and has the highest biological value (BV) of any known protein. Whey Protein 80 is made from the very finest whey protein concentrate with over 80% protein content. Whey Protein 80 is naturally low in fat, carbs and lactose and contains high levels of essential and non-essential amino acids which help shuttle the protein to your muscles post workout and post exercise. Whey Protein 80 is also formulated with ground-breaking patented enzyme technology AMINOGENÂ®, setting it apart in the world of whey protein formulas. Whey Protein 80 is rich in BCAA's and Glutamine. It is the ideal protein to help build muscle size, definition and aid recovery. No fillers or thickeners are used during the production process which guarantees a totally pure product. As we produce all our protein formulas ourselves, each whey protein offers the ultimate in freshness. Here at TPW, you can have supreme confidence in the quality of your product. This is the TPW philosophy that flows through every product we make and sets us apart in the world of sports nutrition today. We don't make big claims about our products, we prefer to let customer ratings, reviews and feedback do the talking for us. This product is supplied in a re-sealable foil pouch to ensure freshness and includes a FREE shaker and scoop.